This year we are not having any themes. Instead we simply want you to explore the stories you are interested and feel are important to young women. Create a 2-4 minute film. Opening and closing credits do not count toward the length of the film. 100% of the film must be created by women, feminine identifying, and/or non-binary filmmakers. Males are allowed in the cast but not the production crew or in post production. All the girls participating in the production process must be 18 years old or younger. Any music used must be original, public domain or creative commons licensed with citation. Deadline Extended: Dec 21th, 2018 at midnight. Announce winners and screen the films at at an event March 29th, 2019. 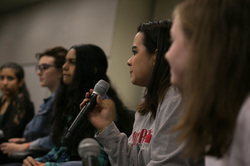 This event is focused on connecting girls with women in the industry. Story Content: Effective use of storytelling techniques appropriate for the genre. Original, strong, clear concept. Camera: Creative use of camera including a variety of shots, angles and depth of field. Audio: Audio is clear. Music/sound effects enhance story. Audio is balanced. Editing: Smooth flow, effective pacing and attention to continuity.